As the saying goes, there’s no rest for the weary. Not for weary, undoubtedly bone-tired Gov. Bruce Rauner and newly minted Democratic nominee J.B. Pritzker, both of whom were back on the campaign trail bright and early Wednesday morning. Nor will voters weary of incessant campaign ads and attacks get any reprieve. Rauner and Pritkzer both debuted fresh ads Wednesday—Rauner used Pritkzer primary rivals Sen. Daniel Biss and Chris Kennedy “in their own words” to slam Pritkzer, while Pritkzer uses news reels shaming Rauner for “four years of failures” as governor. Both men have the personal wealth to do it. Rauner’s a billionaire, or close to one anyway; Pritkzer spent about $70 million of his $3-plus billion fortune on the primary alone. How much more he’ll spend is unclear; it may be limitless. In an interview Wednesday with Chicago Tonight, Pritkzer wouldn’t share whether he’s set a personal spending cap on his campaign, which he’s committed to entirely self-funding. While the millions Rauner spent on ads vilifying primary challenger state Rep. Jeanne Ives as an acolyte of Democrat Michael Madigan may have helped him squeak out a win in Tuesday’s primary, they’re getting in the way of his attempts to bridge the deep divisions within GOP ranks. Rauner—once feared by Republican lawmakers and revered by party faithful for reenergizing the party in 2014—bested Ives by less than 3 points. The governor, who told Chicago Tonight his schedule was “too packed” to be on the program the day after the primary, told WGN-News on Wednesday morning that he would work to bring disenfranchised conservatives back into the fold. Rauner said though he had not yet spoken with Ives, he “looks forward” to visiting with her. Ives is showing no interest. Though she’d previously said she would vote for Rauner should she lose, her husband will not, according to Ives spokeswoman Kathleen Murphy. Murphy said Ives is spending time with family, doing the laundry, regrouping. Pritzker shouldn’t have the same trouble coalescing Democrats. Rauner, however, is casting Pritzker as a Madigan cog and a tax cheat, citing a Chicago Tribune investigation into Caribbean shell companies in Prtizker’s name. Prtizker on Wednesday told Chicago Tonight that the Tribune “got it wrong,” and in its reporting failed to include portions of forms that showed that he had not created the companies. Pritkzer says it’s as he’s always said: Trusts set up generations ago by his ancestors are controlled by a banks that makes investments; instead of personally taking distributions from them, his portion goes to straight to charitable organizations. Pritkzer said he is not considering repatriating the money. Pritzker said the amount saved by the trusts because they’re offshore is negligible, because taxes are not paid on charitable contributions. Pritkzer dominated, winning all but four of Illinois’ 102 counties. Despite holding a press conference Wednesday to characterize Rauner as a “failure,” he says he wants to run a campaign focused on “kitchen table” issues, such as working for a public option for health care, making college more affordable and legalizing marijuana in Illinois. Pritzker wants to pay for services with a graduated income tax—something which would require a constitutional amendment, as currently the constitution explicitly requires a flat rate. Pritkzer was unwilling to give specifics about what brackets or rates he’d implement should legislators pave the way for a progressive tax structure. “We need to pass a constitutional amendment. In order to get that passed, we need to make sure that we’ve negotiated with the legislature what the rates ought to be, and then we’ll present all of that to the voters, and then we’ll get that constitutional amendment passed,” Pritkzer said. He likewise downplayed the possibility of putting the amendment question before voters in November’s election, given that it would require a super-majority of both chambers of the General Assembly. Democrats hold a supermajority in the Illinois Senate, but miss that threshold by four in the House. While it’s possible Democrats could win the necessary 71 House seats in November, it’s also possible Republicans take a bite into Democrats’ majority, which would make it more difficult to get a progressive tax question on the ballot in the 2020 election cycle. March 20: Brace yourselves, Illinois residents. The matchup between Gov. Bruce Rauner and venture capitalist J.B. Pritkzer virtually guarantees incessant campaigning and political ads leading up to the Nov. 6 general election. 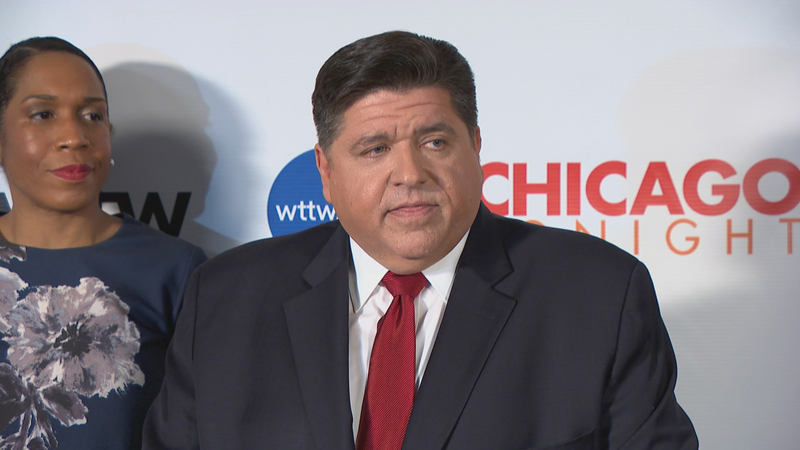 March 14: Democratic gubernatorial front-runner J.B. Pritzker came under intense scrutiny during an hourlong candidate forum Wednesday on “Chicago Tonight” – the final such event before the March 20 primary election. March 14: In their final meeting before the primary, the top three Democratic candidates for governor explain why they should represent their party in November. J.B. Prizker, Chris Kennedy and Daniel Biss join us. March 13: State Rep. Jeanne Ives is running an insurgent campaign to challenge Gov. Bruce Rauner in the Republican gubernatorial primary on March 20. Hear about her campaign and plans for the state in our full video.